Chloë's official author photo. Picture: Carmen Valino. 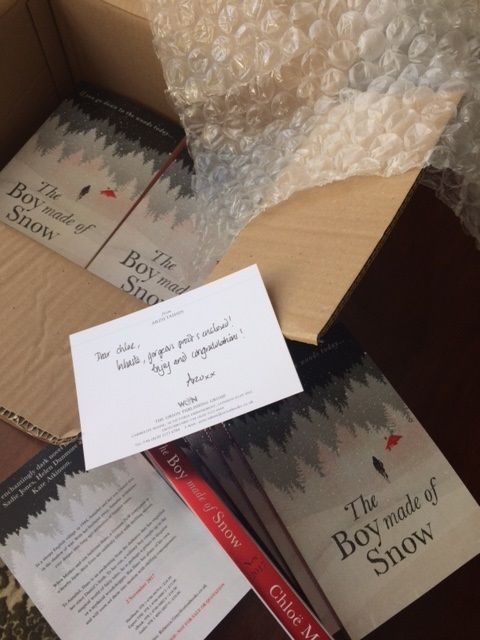 Proof copies of The Boy Made of Snow. Chloë is obsessed with facts and fiction. She gets her facts fix by working as a freelance reporter for national newspapers, and her fiction fix by either reading or writing it in her spare time. Earlier in her career, her work as a journalist on regional titles saw her shortlisted for various awards, including newcomer of the year and reporter of the year. She went on to work as a news editor overseeing several newspapers before becoming a freelance journalist. She has lived and worked in Tokyo and Los Angeles and decided to try her hand at fiction in the US, where the first short story she ever wrote beat more than 8,000 others to win a prize and publication in an anthology. She was so surprised and delighted she immediately began work on her first novel. After spending much of her twenties living abroad, she returned home to the UK and now lives in east London, not far from where she grew up. Chloë is represented by the literary agency Curtis Brown. Her debut novel, The Boy Made of Snow, was published in the UK by the award-winning imprint W&N at Orion/Hachette and hit the shops in November 2017. The book is available to buy here. Chloë accidentally ends up on TV as she covers a story.